Red or orange chalcedony is referred to as carnelian, the warm tones resulting from the inclusion of iron (in the form of haematite in the redder material, and limonite in the orangey-yellow variety). Carnelian is often found in pebble form at ground level or in gravel deposits in the Arbaian and Egyptian deserts, India, Japan and China. In China, these deposits are found in the mineral-rich Xinjiang province, which provided red chalcedony in a number of varieties. This material was commonly used to produce a range of small, compressed ovoid bottles of a form favored at Court during the Qing dynasty. 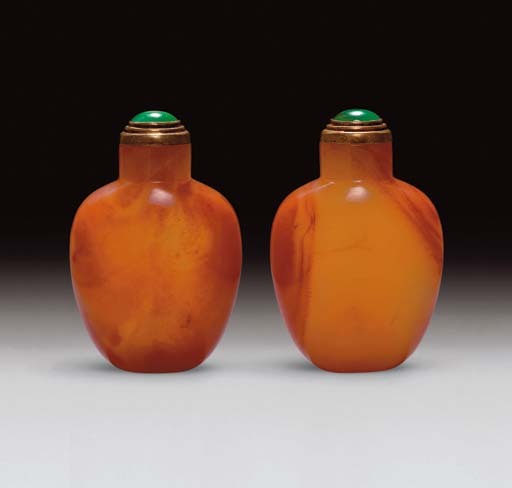 For a smaller version of darker red color, see Moss, Graham, Tsang, A Treasury of Chinese Snuff Bottles, Vol. 2, Quartz, no. 202.